​​I'm always interested by the health habits of athletes. What do they eat before a race or a game? What kinds of recovery exercise do they do? How many hours of sleep do they get on a night? Unlike what you might be thinking, this fascination has less to do with stalking and more to do trying to understand how the world's fittest people prime themselves for maximum efficiency. That isn't to say I'm going to start getting up at five a.m. to run five miles before work just because a world champion soccer player does. That sounds like a nightmare. All the same, though, it's an interesting nightmare. The culmination of all those healthy habits—however extreme they may be—is a human being at the peak of their ability. That's fascinating. Operating at maximum efficiency is a challenge for everyone and everything. It never comes without sacrifice. For a person, it means hard work and restraint. For a machine, it means frequent maintenance and expert engineering. What does a swimming pool need to achieve maximum efficiency? ​The answer to this question is most likely: what doesn't one need? You undoubtedly do all you can and a little bit more to keep your energy costs down, your water use low, and your swimmers happy. But what if there was one more thing you could use to prime your pool for its performance peak? Using a liquid pool cover in your pool will help you achieve your performance goals. 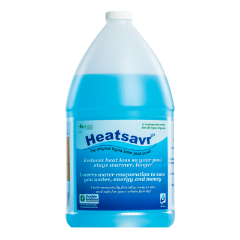 By inhibiting evaporation, Heatsavr prevents up to 35% of heat loss and 50% of water loss. That means it will be cheaper to heat your pool, but also that there will be less humidity in the air and thus better air quality. How's that for ramping up your efficiency? And you won't have to make a big sacrifice. Not only is the application method easy as pie, but you'll actually end up saving money. That's much easier to swallow than a five a.m. run. If only they made Heatsavr for people. ​Swimming pools are great luxuries to have and there’s a lot of reasons to own one. However, many consider pools to be a “waste of water” - especially in California where we are currently in a drought. While I don’t necessarily agree with this sentiment I do think it is important for ALL pool owners to take the necessary steps to reduce their impact on the environment. Here, we’ve detailed a number of things you can do to be more environmentally conscious. Some are easy to do and some require a little more work. We’ve ordered these from easiest to implement to hardest (you’ll see the easiest ways first). Hopefully, you’ll decide to implement at least a few of these. ​Halloween is just around the corner and things are getting spooky. What's the scariest thing in your pool? Is it the shark that lives in the deep end? The ghost in the whirlpool? What about the swamp thing in the filtration system? Your supernatural swimmers might be scary, but the phantom with the highest fright factor is the one stealing your pool's heat—and it doesn't just come around once a year. Every day, every second, moisture and heat from your pool is being sucked up into thin air. And, unlike the skeleton that works in the snack bar, evaporation is just a nuisance. Using a liquid pool cover will help. Heatsavr reduces up to 50% of your pool's evaporation by creating a one molecule-thick layer on the surface of the water, thus ensuring the water and heat stay where they belong. 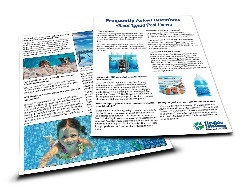 It has been proven to reduce up to 35% of pool heating costs, which is good for your wallet, the environment, and the hydra nesting in your heater. ​And the best part? Heatsavr is odorless, tasteless, and colorless. It's completely safe and biodegradable, and once it's in the pool, nobody will know it's there. Not even the super sensitive vampire training for the 2096 Olympics. The one and only thing your swimmers might notice? The improvement in air quality. Less water in the air also means less humidity, and that's a benefit everyone will enjoy. Scared of change? Aren't we all sometimes. But this is a change you won't regret—and a product you won't ever want to be without. ​I always find that the period between the beginning of September and the end of December goes by in less time than it takes to say "Trick-or-treat-Happy-Thanksgiving-Merry-Christmas!" It's a rush of decorating, re-decorating, re-re-decorating, and lots and lots of cleaning. I think we can all agree this season errs on the side of stressful. I bet your center has a lot scheduled this fall. With so many dates, events, and tasks, you're likely up to your neck with work and stressed to the nines. The last thing you need is to start using a new product in your pool, right? Well...maybe not. Would you agree that you're never too busy to save a little money? What about a lot of money? 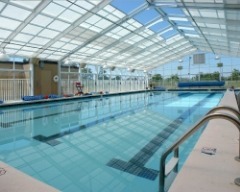 Using Heatsavr, our patented liquid pool cover product, can save your facility up to 35% on its pool heating costs. That kind of money won't allow you to pack up for an extended vacation, but it will give you a little more flexibility to host fun events or buy staff incentives. 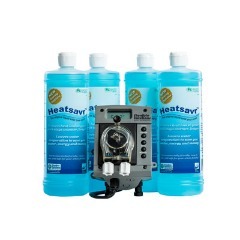 ​But what about the hassle of adding Heatsavr to your pool care routine? We've got that covered too. Our automated pump is easy to install and takes care of your pool's dosing for you. Once it's set up, you'll quickly start noticing a decrease in both energy wastage and humidity. That means your pool will be cheaper to run and more pleasant to be around. There are lots of products that claim to provide amazing results, but few that follow through. Heatsavr does. If you don't believe me, check out our testimonials for yourself. Over the years, dozens of happy customers have felt so strongly about our product that they've been willing to put their name behind it. Will our next happy customer be you?